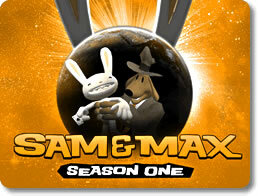 Sam & Max Season One Game Review - Download and Play Free Version! If you love being entertained by hilarious adventure games, it doesn't get any better than Sam & Max! Witty and entertaining dialogue between characters. Easy point and click format. 3D locations in which you move through the city to solve crime. Excellent voice acting, music and animation. Slow movement - characters walk slowly. Some content and language could be offensive and inappropriate to younger players. Limited inventory items needed to solve crime. Looney Sam & Max are back with 6 awesome adventures! One's a six-foot tall canine shamus with a love of justice. The other's a hyperkinetic rabbity-thing with a taste for violence and an over sized Luger. Together, Sam & Max are the Freelance Police, ridding the streets of bottom-feeding sludge one dastardly miscreant at a time. Sam & Max games are easy to use point and click adventure games similar to Myst or the old LucasArts classics like Secret of Monkey Island or Maniac Mansion. You must find and collect objects and use them on the environment to solve puzzles and advance the story. You may have played adventure games before, but maybe not with this same kind of humor! You have to play it to experience just what kind of whacky stuff comes out of these guys' mouths. Episode 2 Situation Comedy - A talk show host has gone crazy and is holding her audience captive! Episode 3 The Mole, The Mob, & The Meatball - Find out what has happened to an agent that has penetrated the Toy Mafia! Epsidoe 5 Reality 2.0 - People are being hypnotized by the Internet, pull the plug before it is too late! All these full version episodes normally sell for $8.95 each ($53.70 for all) so getting them all at once saves you $23.71 - thats 56% off the regular price! Get the full version or download the free trial today and enjoy all the fun Sam & Max have to offer. Sam and Max are a dynamic, oddly matched duo who combine their respective love of justice and violence to solve cases in the underbelly of their town. A point-and-click adventure game with elements of an RPG seen in the dialogue options, it is easy to maneuver through various locations in the town and pick up items needed to solve some peculiar cases. Perhaps the most exciting feature of this game is it's comical and witty dialogue that is greatly appreciated by a mature audience. Violently rear-ending motorists to bring your speeding police car to a halt, shooting out taillights to impose outrageous fines to pay for tear gas is just one of many over-the-top plots you will find in this game and parents should be advised of such elements. That said, the scenarios in which you find yourselves are hilarious and fun to watch, and with six episodes in this season, expect hours of entertainment. To the player seeking an adventure game, the greatest drawback will be that too much of the game is reliant on dialogue options with very little inventory object collecting to solve crimes. 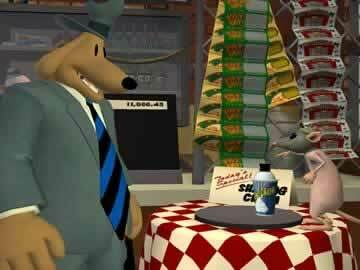 Overall, Sam & Max is an amusing game that offers witty dialogue and an easy to learn format, but is perhaps too simple for some players and contains content that might not be suitable for all age groups. This game is recommended to players who enjoy adventure elements and are of an appropriate age. 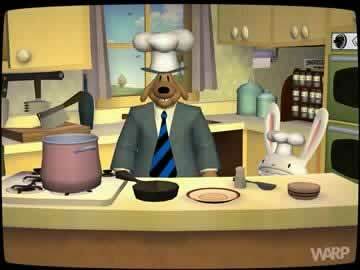 Gameplay clip from Sam & Max Season One - characters talking to each other and using objects in the office.